I'm back! I actually didn't intend on taking a break from blogging. But, Spring Break ended up being the perfect time to take a break from the Internet and focus on myself. Spring Break has sadly come and gone, though. The day before Spring Break, I stopped in the teacher's lounge to check my mailbox. In the middle of a pile of mostly junk mail and forms to fill out for the special education teacher, I found a padded envelope. It was addressed to me, and I didn't recognize the name on the return address. Intrigued, I turned it over to open it and saw a message in Sharpie: Happy Pi Day! I wasn't sure what I would find inside, but I was definitely excited! You see, Pi Day and I don't have the best track record. This year, I was determined to have an amazing Pi Day! Last year, I ended up in the emergency room on Pi Day. A couple of months ago, I was super excited to get a free Pi Day pencil sample in the mail. Want to know what I found when I opened up the envelope? An advertisement, plastic bubble packaging, and nothing else. I'm pretty sure some postal employee somewhere is enjoying my Pi Day pencil. Needless to say, I did not end up purchasing Pi Day pencils for my students. We did celebrate however in grand style, but you'll have to wait for another post to read about that. 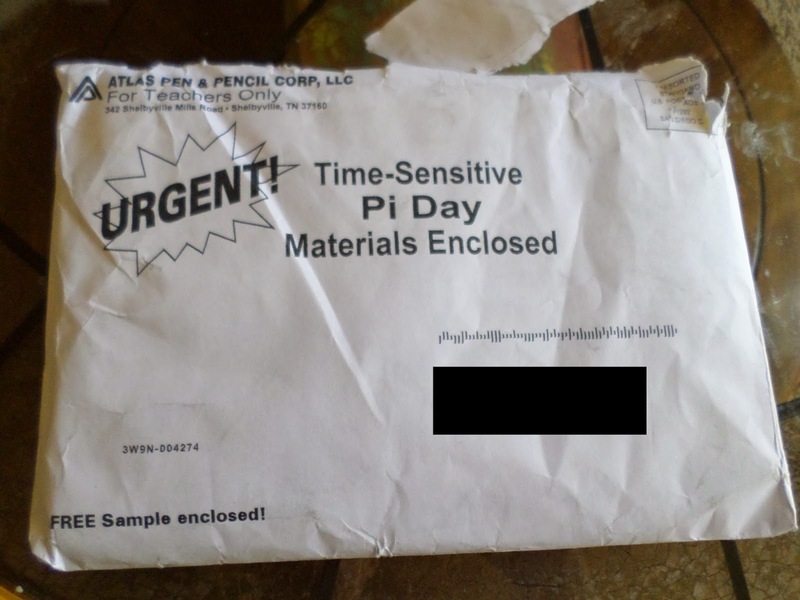 This post isn't about Pi Day; it's about my mystery envelope. I LOVE getting mail! There's nothing quite like a handwritten card letter or a package in the mail to cheer you up! The first thing I pulled out of the envelope was another envelope. Mail from another math teacher. What could this be??? Inside was a sweet, beautiful card from Jackie, a faithful blog reader and fellow math teacher. Jackie's husband, Jeff, is a jewelry designer. And, he has designed a line of mathematical jewelry. Jackie was nice enough to send some along to say thanks for my blog. Thanks Jackie for taking the time to read my blog! And, I absolutely LOVE the jewelry! Thank you, thank you, thank you! Want to see? I received a sterling silver pi pendant. It's hanging, here, on my bulletin board of jewelry. I kinda have a LOT of jewelry. I hang all of my necklaces from thumbtacks on a giant bulletin board to keep them from getting tangled. It also helps me to easily see all of my choices when I am getting ready in the morning. I picked up a chain to wear it on from Hobby Lobby, and I've been wearing it everywhere. It even sparked an awesome conversation about pi and math and such with my optometrist. Multiple students have noticed my pi necklace this week and complimented me on it, too. Also in the pouch were infinity symbol earrings and an infinity symbol bracelet. They are beautiful! I took some pictures of the bracelet while wearing it the other day. Let's just say I do not have a future as a hand or jewelry model. Though my modeling skills are lacking, the bracelet is simply gorgeous! I absolutely adore the clasp on this bracelet. I've never had a bracelet that clasps this way, and I just think it's beautiful. I haven't had a chance to wear the earrings yet. Actually, to tell the truth I just got my ears pierced so I could wear these. I've wanted to get my ears pierced for years, but I just never did anything about it. I decided Spring Break was the perfect time to remedy this. Besides, what better motivator could there be than precious infinity symbol earrings? Now, I just have to wait 6 weeks until I can take out the earrings they used to pierce my ears with. You can count on the fact that I'll be rocking these infinity symbols this summer! All of Jeff's jewelry is handcrafted from Argentium sterling silver. Jeff and Jackie didn't ask me to write this post or link to his Etsy store. That's all my doing. I can't express enough just how impressed I am with the quality and creativity of the jewelry they surprised me with. If pi and infinity aren't exactly your thing (though, I'm not sure how that's even possible! ), there are tons more mathematically inspired pieces to choose from! And, the pictures are so much better than mine! Click the image above or follow this link to see all of Jeff's amazing mathematical pieces in his Etsy store, OrionSilverworks! The jewelry is beautiful, creative, and of the highest quality. I'm so impressed and thankful for the pieces I received. And, I know you'll be impressed, too! If you've been reading my blog lately, you probably can tell that I'm a conic section convert. I'm a conic section hater turned a conic section lover. Confession time. Before this school year, I didn't really know why they were called conic sections. Maybe you're thinking, "Duh, Sarah! It tells you in the name!" Or, maybe you're like me and you never made the connection. Conic means "of or pertaining to a cone." Every single conic section can be formed from a cone. How did I not see that before? I guess I never really questioned why they were called conic sections when I studied them in high school. This isn't the first obvious connection I've failed to make. A couple of weeks ago, I was in my car, driving to visit my parents. One of the roads that I grew up around in Broken Arrow is known as "County Line Road." Well, technically, it's 193rd E Ave, but everybody just calls it "County Line." As I was driving down an entirely different road, I had an epiphany. It's called County Line Road because it follows the county line between Wagoner County and Tulsa County. How in the world did it take me 24 years of my life to figure this out? It should have been obvious. I was so excited about the realization that I had to call my mom and tell her about my discovery. Instead of laughing or making fun of me for taking so long to realize this, she commented, "Well, I guess you've had more important things to think about than the names of roads." Thanks, Mom! But, I still think I probably should have realized this sooner than I did. Apparently, my sister had realized this because she was less than impressed with my recent discovery. Her reaction was more along the lines of: "How in the world did you not know that?!?" It happens, okay? Since I didn't want my students to be like me and go throughout high school, four years of college to get a math degree, and a year of teaching without realizing exactly what conic sections were, I designed this foldable to put in their interactive notebooks. I stole some pictures from online that show how each conic section is created by taking the cross section of a cone. And, I put these on the outside flaps of the foldable. On the inside, I decided to steal an idea I had seen online. Take paper cones (think snow cones), cut them to form the conic section, dip them in paint, and stamp the conic section. I was going to have students work together in groups of 4. Each student would be responsible for cutting one conic section. All the students would stamp the cut cone in the correct section inside their foldable to form the conic section. Other people have done it. I read about it from Miss Ruldolph. And, I originally saw the idea on Walking In Mathland. Seriously, you need to follow these links and then come back here to read about my adventures. I promise. It'll make a lot more sense if you do! The day before I wanted to do this in class, I decided I needed to go to Wal-Mart and buy some paper cones. Did I mention this was back in late January? Either I was looking at the wrong place in the store OR it's a seasonal item. All I know, is I couldn't find the paper cones at two different Wal-Marts. Of course, in retrospect, maybe I should have looked in the sporting goods section where they sell water jugs and the like. It's okay, I thought, paper cones are just made out of paper. So, I printed off some cone templates on card stock, cut them out, and glued together several cones. So far, so good, or so I thought. Then, I went to cut them. I figured I would start with the circle because it looked to be the easiest. I squeezed the cone shut, made a straight cut, and opened the cone back up to find that I had most definitely NOT made a circle. I tried again. And, again, I ended up with something that was not a circle. I tried cutting an ellipse. It didn't work any better. The parabola came out looking like a hybrid between a quadratic function and an absolute value function. And, let's not even talk about the hyperbola. Obviously, it can be done because I've seen it on other blogs. But, I couldn't figure out how to cut the cones so they actually formed the conic sections. Needless to say, I ended up scrapping this idea and just jumping into the formulas for various conic sections. If anyone has some advice for how to actually cut the cones, I'd gladly take it. I feel like I must be overlooking something obvious. I think my problem is that I'm squeezing the cone shut before I cut it. But, I'm not sure how to cut the cone without squeezing it shut first. Help! But, I thought I would go ahead and post the foldable I created in case it would be of use to anybody else. I planned on having my students stamp conic sections on the inside. But, I guess you could have your students write formulas or work out examples. You can download the file and my other conic section files here. It's been a little while since my last edition of Things Teenagers Say. If you're new to my blog, be sure to check out the previous hilarious conversations I've either had with students or overheard in my classroom. You look like you're dead. Thanks! I blame the document camera. Student A: You're 23, right? Student B: Of course she's 24. We've only been talking about it ALL year. Okay. I might of made kind of a big deal out of my birthday. I know. I just can't stop looking at your legs. Teenagers are the best at awkward comments. Me: And, we know that the slope of every vertical line is undefined. Student: Is that language really necessary? Oh no! I just used the worst curse word ever in math and in algebra in class! There are 51 states, right? You say "Uno" when you have two cards left, right? Me: Unless you are texting someone that today is your math teacher's birthday, your phone should NOT be out! What do you get when you combine nutella and salmon? Student: I'm glad you didn't give us a test today. We've had like 8 tests today. Me: It's only 6th hour. While doing a worksheet that asks students to write an inequality symbol that correctly compares two students. Student: I need some help. Me: Okay. Which problem are you on? Student: Number of inches in a yard. Me: And, what's your question? Student: How am I supposed to know how big their backyard is? Student: Oh, that kind of yard. While working on another question on the same worksheet. There are definitely more oceans than continents. Your Z's look like the Hitler symbol. And, this is what you get when you start putting a line through your Z's in the 8th grade because your Algebra 1 teacher puts lines through her Z's. Student A: Don't so-and-so and so-and-so look alike? Student C: They don't look exactly alike. Student B: They're fraternity twins! After over thirteen hours at school today, I'm happy that Monday is almost over! We had parent/teacher conferences this evening from 3:30-6:30, and we'll do the same tomorrow night. That makes for a very long day, but I guess we do get out of school on Friday to make up for it. Of course, that means my Pi Day celebration has been thrown off once again. One day, I will actually celebrate Pi Day with my students on Pi Day! In other news, I got a new desk decoration that I haven't been able to take my eyes off of today. It's beautiful, it's mathematical, and it's courtesy of my amazing, artistic sister. She made this last semester as one of her pottery projects. Then, she fired it and glazed it. I LOVE it! It fits my personality perfectly. And, it definitely reminds me of Frankoma Pottery. Each of the four sides features a different mathematical symbol. Today, I had a student stay to complete some missing assignments during parent/teacher conference time. This student's sister, a 7th grader, was stuck in my room for 2+ hours. She looked at all my posters, played with my various mathematical toys, and spent a good chunk of time trying to solve my Rubik's cube. One of the first thing that caught her eye was my new pencil/highlighter holder. Oooh! That's the pi symbol. And, it has a square root symbol on this side. And, this means infinity. Then, she got to the side featuring i. What is this? Her brother quickly piped up that i is the square root of negative one. I could see the wheels inside her head turning as she tried to figure out the square root of negative one. That's negative one, right? What's negative one times negative one? Positive one. So, that means negative one cannot be the square root of negative one. The next thing I know, her brother and I are discussing where i would be on the number line. These are the types of conversations that I LOVE! We discussed the number pi and how it goes on forever. I have issued a challenge to my students to memorize as many digits of pi as possible for our early Pi Day celebration on Wednesday. Today, I handed out slips of paper to my students with the first 1000 digits of pi. One student immediately asked, "Where's the pattern?" There is no pattern. Pi never repeats. That's why it's irrational. "Oh man! That was how I was going to win. I was just going to memorize up until the point that it started repeating..."
Art that sparks mathematical conversations? Yeah, I'll take that any day! One of my students' favorite ways to solve quadratic equations is by square roots. I covered solving by square roots after solving by factoring. Since my Algebra 2 students still struggle with factoring fluently, solving by square roots is like a breath of fresh air to them. They get it. Square roots are accessible. However, they have a tendency to forget that the square root of sixteen is not just four. It's positive or negative four. No matter how many times I emphasize it, they can't seem to remember the plus or minus sign in front of their answer. This year, I decided to remedy this by putting an obnoxiously large plus or minus sign in their notebook. We took the notes on top of the plus or minus sign. These are the same plus or minus signs that I used last year for graphing different types of slope in Algebra 1. I love finding new uses for files I've already created! I wish I could say that this method was fool-proof. I wish I could say that my students never forgot the plus or minus sign in front of their answer. But, then, I'd be lying to you. I do think that this visual helped some of my students, though. Here's the two-page spread in our interactive notebooks. I have yet to blog about the Zero-Product Property and Solving Quadratics by Factoring yet. They're coming, though. I promise. Pinkie promise. You may download my quadratic function files below. If you have trouble accessing the file, please send me an e-mail. I will be happy to attach the files and send them your way! One of the things that has been keeping me busy for the past couple of weeks is getting everything ready for our blood drive at school. Student Council was volunteered to help run the blood drive, and I'm in charge of Student Council. So, it's only naturally that I'm now semi-in-charge of the blood drive. Have I mentioned that I know nothing about coordinating a blood drive? I've never even donated blood before. I've always had trouble getting blood drawn, so I've always assumed I would have trouble donating blood. Seriously, I'm that patient that goes to Urgent Care and leaves with the nickname of Pin Cushion because it takes 2 nurses and 2 doctors to finally draw blood. It's not a good sign when the doctor says, "Wow! I've never seen anybody with veins quite like yours before. I give up. I'm not poking you again. Somebody else will have to draw your blood." I kind of took over the trophy case with blood drive reminders. I hung up a poster, a sample of the t-shirt people will get for donating, a poster with QR codes that can be scanned for more information, and a gigantic sign-up sheet. I'm hoping our turnout is good for this blood drive. Thanks to our recent snow storm, the Oklahoma Blood Institute had to cancel multiple blood drives. So, they are relying on our blood drive to have a good turnout in order to hopefully avoid shortages. Anyone have any advice to offer a first time blood drive coordinator? I definitely need it! So, even after writing 273 blog posts, I'm still not exactly sure what people want to read about. If y'all haven't noticed, I just tend to write about everything. Foldables. Games. Lessons that didn't go quite as planned. Books I'm reading. Funny things my students say. Student council projects. Commentary on the weather. Last Wednesday, I took a group of six student council members to our district meeting in Ponca City. If you're unfamiliar with your Oklahoma geography, Ponca City is practically in Kansas. As you drive north to Ponca City, the highway signs read: "Ponca City X miles; State Line Y miles." District meetings are an opportunity for students from various student councils across our region of the state to come together to listen to a speaker and complete a service project. The theme for our meeting was "The Road to Success." The Ponca City High School Student Council did a great job with the decorations! While waiting for the program to start, we enjoyed muffins and donuts. I took this time to draw a picture on the back of our envelope of registration materials. Keep in mind that I am not an artist. Yeah, I think I'll stick with teaching math. I love how they used the old license plates to decorate with! The highlight of our trip was the speaker, Tiffany Smiling. Tiffany is an entrepreneur and founder of Project Orphans. Project Orphans is a charity that was created to build and staff homes for orphans in Uganda, Jamaica, Burma, and Haiti. Tiffany was a powerful speaker with a powerful story. If you have time today, I would suggest that you spend some of it listening to Tiffany tell her story of overcoming a childhood diagnosis of a rare form of brain cancer and doing what others deemed impossible. It's not quite twelve minutes long, and I think it will be well worth your time. My students left inspired, and they couldn't quit talking about how touched they were by her story. If you can't see the video embedded below, follow this link to youtube. Warning, you might want to make sure you have a kleenex handy. As this school year starts to come to a close, I'm reflecting on what worked and what didn't work. Yes, I realize it's only the beginning of March. We haven't even had Spring Break yet. But, I've woken up to the realization that I have 20 school days left with my students before end-of-instruction testing begins. 20 days. 20 days! I did this counting on Friday when our counselor e-mailed out the standardized testing schedule. I pulled out my calendar and counted. 23 days. Then, we had two snow days. Awesome. I'm currently working on a plan to figure out how to tie up all the lose ends before testing. My Algebra 2 students have yet to do polynomial long division, solving rational equations, composition of functions, or operations with functions. My Algebra 1 students still need to learn solving systems by substitution, solving systems by elimination, graphing linear inequalities, graphing absolute value graphs, and simplifying radicals. My, oh my! It is going to be a sprint to the finish! Okay. Back to the topic of hand. What has worked well? What do I need to change for next year? This year, I feel like I did a WAY better job with quadratic functions in Algebra 2. Way better. Let's be honest. It wouldn't take much to do a better job than last year. Last year, I didn't even teach my students the names for the different forms of a quadratic function. We did all our graphing using the calculator last year, so I didn't think it really mattered. This year, I made it my goal that students would identify the form of a quadratic function first. Here's how I modeled it on my SMART Board. Here are the names of the forms. Here are the formulas. What do you notice? How can you tell them apart? Vertex form has parentheses. Doesn't intercept form have parentheses, too? The parentheses in vertex form have an exponent of two. Now, we're getting somewhere. Intercept form will always have two sets of parentheses. Will it? Are you sure? They continued throwing out ideas on how to tell the different forms apart. I'm kinda glad I had them have this conversation as a class before we ever started trying to classify quadratics by their form. We played one of my favorite games for classifying stuff. 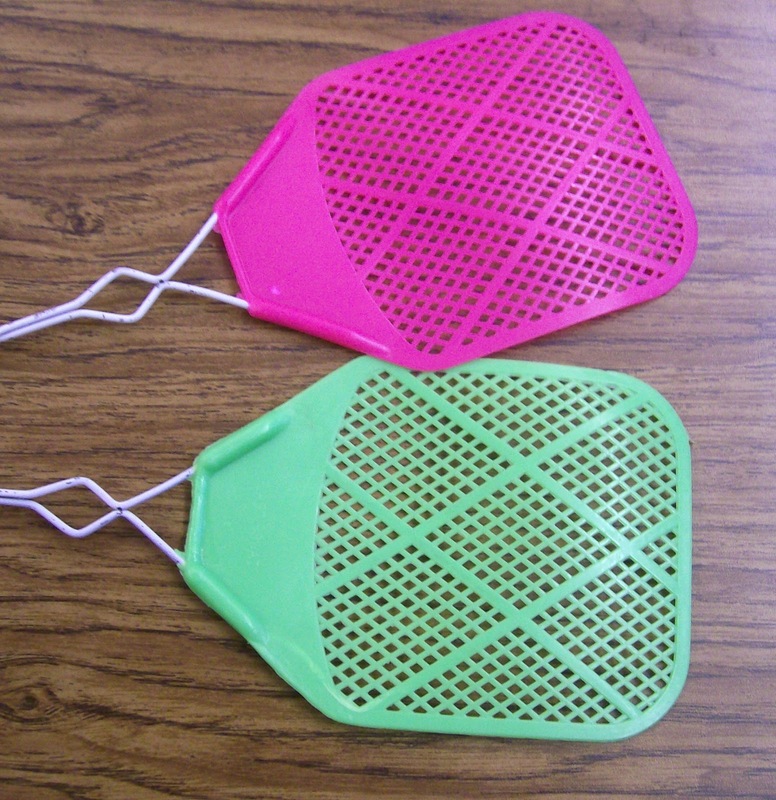 The Flyswatter Game! Two teams. Throw a picture of a function on the SMART Board. First player to correctly swat the correct form on the dry erase board gets to stay in the game. Other player has to sit down. Two new players go to the board. Another function. Another showdown. Winner stays in the game. Loser sits. Game continues until only one team is left. Practice, practice, practice. I made a slight change to the flyswatter game this time around, though. I had students who weren't playing at the time stay in their seats. They used their notebooks to determine the form. Students at the board had to determine the form without their notebooks. Students with notebooks "graded" the work of the students at the board. The best part of the game was hearing students explain to other students why their classification was wrong. "But, it can't be in standard form. It has parentheses. Standard form will never have parentheses." Students teaching students. Win! On Day 2, we went back to our foldables. We added in instructions on how to graph quadratics depending on their forms. This foldable, by the way, is made from a single sheet of paper that has been cut in half hamburger/taco style. Lay the two layers of paper on top of each other. Scoot the top layer up an inch or so. Bring the top of the paper down to bottom of the paper to create four flaps. Staple. Take notes. Enjoy. The bottom of each section contains important information about the equation and its graph. The top of each flap contains an example. After we created this foldable, we went back to the functions from the flyswatter game. Again, we would determine the form. But, this time we had the necessary tools to graph the function. We graphed the functions on mini dry erase boards, and students held up their boards to be checked. Next year, I want to set out to make this even better. Ideas? Do you explicitly teach the different forms of a quadratic function? I'd love to hear from you in the comments! Oklahoma weather is crazy. There, I said it. Now, don't get me wrong. There are a ton of things to love about this state that I call home. We've got the most beautiful sunsets in the world. Okay, I might be just a tad bit biased. But, seriously, our skies are gorgeous. And, the people here are the epitome of friendly. I grew up in a rural, small-ish suburb of Tulsa where waving at every passing car is an expectation. Now, I'm living in a true small town with population 2,909. It's the type of place where your neighbor shows up at your school to offer you a couch. (I declined the offer. Apparently, someone had told him that I didn't have enough furniture. That's probably because I moved in over the span of a week, just a few pieces of furniture at a time. Don't worry. My living room is nicely outfitted.) This is the same neighbor who stops by every six months or so to remind you where the closest storm cellars are. This past Friday, he stopped me while I was checking my mailbox to tell me that our local bank had been bought out by another bank. I needn't worry, though, because the employees would stay the same. The name would be the only thing that would change. And, they would soon be issuing us new debit cards and checks. I didn't have the heart to tell him that I actually banked with the bank that had bought out our local bank so none of this would affect me. Yeah, there are some downsides to Oklahoma. Tornadoes are a major one. Drumright has been hit twice by tornadoes, once in the 50's and once in the 70's. They're a way of life here. We've made them our school mascot. At times, it seems a bit disrespectful. We yell, "Go Tornadoes!" at sporting events. Maybe it's not disrespectful. Maybe it's more of a homage to the fact that this town sticks together and rebuilds in the face of adversity. Thankfully, I've never needed to seek out shelter in one on of my neighbors' storm cellars since moving here. But, I have seen this town come together and rally when wildfires forced a city-wide evacuation. I witnessed families helping other families rebuild. Money, possessions, homes, hope. They were all shared. Now that I've gone off on a sentimental tangent, let's get back to the present. For the past couple of weeks, the weather has alternated between divine and downright chilly. One day, it's warm enough to go out for a run. The next day, I'm wishing for my parka. Saturday, my sister called me to remind me that a snowstorm was headed in. And, like all Oklahomans do, I should probably go to the store to stock up on milk and bread. The weather was actually pretty nice. I didn't even wear a jacket to the store. I stocked up on some essentials. Milk. Tortilla Chips. Cheerios. That's what you'd stock up on too, right? The snow came Sunday morning. Sunday afternoon, it snowed and sleeted and thundered all at the same time. Thunder Sleet. That's what they called it. All, I know is that it was a weird sensation. Sunday afternoon, I got the call that school would be cancelled Monday. That would be Snow Day #5. It was a good thing, too. You couldn't see the road in front of my house. On top of that, it felt like it was fifteen below zero. What did I do with my snow day? I read. I baked some cookies. I read some more. I stared out the window at the tracks filling my yard. That was a mistake. The snow was so bright that it made my eyes hurt. Yesterday was Snow Day #6. I read. I baked more cookies. I napped. I read some more. I browsed math teacher blogs. By the afternoon, the snow had finally melted enough to see pavement! As much as I've enjoyed this unexpected time off to read and relax, I'm ready to be back at school. I've got too much to do in the next couple of weeks. Last year, we only had one snow day. So, having 6+ this year has been quite an adjustment. Since this post is already a random hodgepodge, here are two other pictures I took last week. Last week, the school put down some type of fertilizer on the grass in front of the building. You know, the type that turns the grass an artificial green color. One day before school, one of my students came rushing up to me. "Ms. Hagan! Did you see the vandalism outside the school?!? Somebody spray painted the grass!" I hadn't noticed any vandalism when I had came in the front doors that morning, but I walked to the front doors to have a look. "Why would someone spray paint the grass green? That doesn't make any sense!" I had to stifle back a laugh. That's not vandalism, and it's not spray paint. It's fertilizer. "Why would they make the fertilizer look like green spray paint?" Well, they do that so they can see where they've sprayed the fertilizer. This seemed to satisfy my student's curiosity. I'm not sure I will ever look at this artificial green application of fertilizer quite the same after this conversation! Did I get your attention with the title of my post? Before you call PETA on me, please read the rest of the post. I don't want to kill kittens. You could say I'm in the saving kittens business. Confused? Let me explain. My Algebra 2 students just started one of our last units on rational functions. We're working on simplifying rational functions You know, factor everything. Cancel out factors, not terms. My students love, love, love to cancel out terms. Last year, I preached and preached about the difference between factors and terms. But, it didn't seem to do much good. This year, I decided to take a different approach. I gave my normal spiel. Okay guys. Today, we're learning something new. Well, actually it's not entirely new. We're going to combine lots of stuff we've done before to do something we've never done before. Now, before we start, I want to warn you of an important rule. You can only cancel out factors. Factors are things that are being multiplied. You may never cancel out terms. Terms are things that are being added. By this time, the eyes of almost everybody in class have glazed over. Or, they're talking to their neighbors. Or, they're trying to text somebody without me noticing. I realize they haven't heard a word that I've said. That's okay. I expected this. I was prepared for this. Cue the next slide in my SMART Board file. 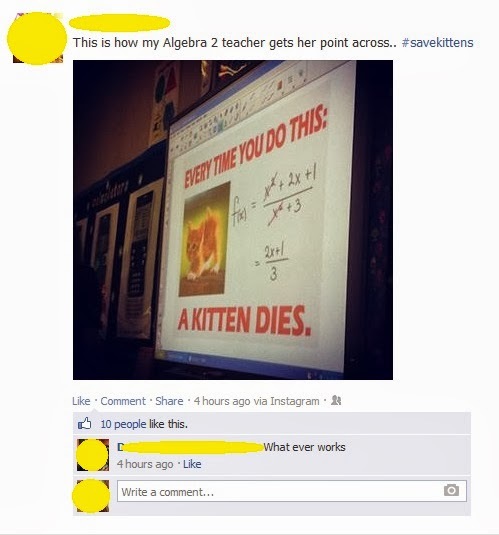 Rational Functions - Every time you do this, a kitten dies. All of a sudden, I have the attention of my class. There is an audible gasp. Comments are made about how horrible of a person I am for wanting to kill a kitten. Eventually, a student asks, "Why would doing that cause a kitten to die?" Oh, I'm so glad that you asked! I hit the back button to return to my slide that talks about the difference between factors and terms. I once again remind them that they are only allowed to cancel out factors, not terms. We return to the slide with the adorable kitten. Are the x squared terms factors or terms? They are being added, so they are terms. And, we never, ever, ever cancel out terms! Want a copy of this image or others to use with your students? I downloaded this from Math Curmudgeon. Some of the shock wears off. A few students nod their heads as if they understand. One student asks if she can take a picture of the screen before we move on. Sure! Students posting about math on social media? I can handle this. We move on to practice problems. I put up a rational expression on the SMART Board. Students attempt to simplify it on their mini dry erase boards. They hold up their work for instant feedback. I continually warn them. Factor everything first. This allows you to cancel factors! Please, please, please don't try to cancel out terms. Remember, every time you cancel terms, a kitten dies. And, if you try to cancel out terms, I will be forced to draw a dead kitten on the board. We do well until we get to this problem: (35x-35) / (25x - 40). With some prompting, the students successfully factor out a five from the numerator and denominator and cancel them out. Then, another student suggests that we cancel out the x's. Oh no!!!!! You just killed a kitten. The x's are terms, not factors. Oh no!!!!!!! Now, I'm going to have to draw a dead kitten on the board. I warned you this would happen. You should have been more careful. By this point in the year, my students are very well aware of the fact that I cannot draw. So, they are eagerly awaiting to see what this dead cat will look like. I hadn't exactly planned this far ahead, so I'm eager to find out what my drawing will look like, too. After I draw the cat, I have a dilemma. How in the world am I going to make this a dead cat?!? I don't want to do something too gruesome. Eventually, I settle on a red x through my cat. That should get the point across. My students are pleasantly surprised with how good my cat turned out. Though, they protest that the cat shouldn't be smiling since it's dead. I'm sorry. I've never drawn a dead cat before. And, this is the only way I know to draw a mouth on a cat. Another student decides we need a more permanent memorial to the cat our class has sacrificed today with our carelessness. 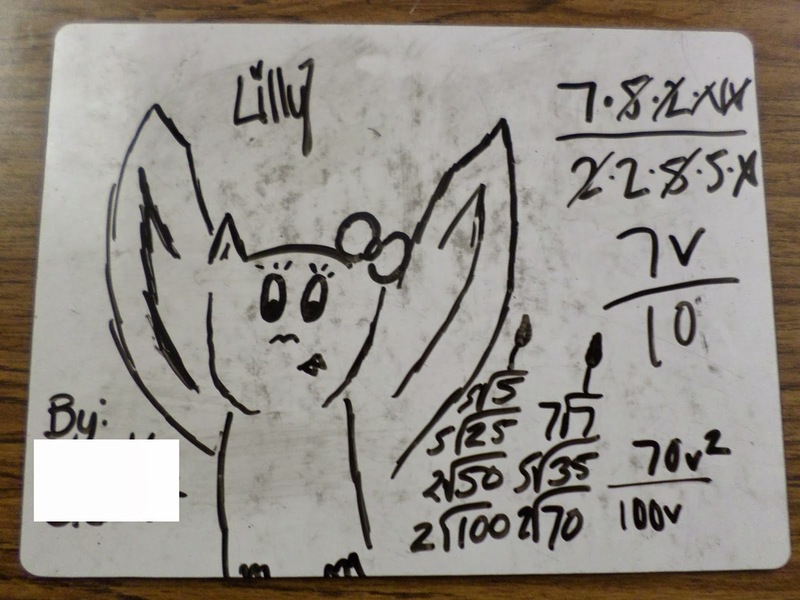 She draws a cat and balances the dry erase board above my bulletin board. She even gives it a name. Pablo. Died February 28, 2014. My afternoon Algebra 2 class comes in. Why is there a cat on the wall? You'll find out. I give them an even more impassioned plea. 2nd hour killed a kitten. They killed a cat! Can you believe it? I was forced to draw a dead cat on the board as a result. Please don't make me go through that nightmare again! Please, don't kill a cat. Only cancel factors, not terms. My fifth hour is much more careful of their canceling. No kittens were killed during our first 50 minutes of simplifying. I can only hope that streak continues. In elementary school and middle school, my teachers loved to have us write poems about ourselves. They would give us templates, and we would have to fill in the templates with adjectives to describe ourselves. I hated these assignments because I could never come up with adjectives to describe myself on my own. I usually ended up enlisting the help of my mom and sister to write these poems. Usually, these poems ended up focusing on the fact that I was shy, quiet, kind, thoughtful, intelligent, honest, etc. There were a lot of words I never even considered. A lot of times, I focused more on what I wasn't than what I was. I dreamed of being more outgoing. I dreamed of having more of an influence. But, nobody would have ever known that from my actions. I never spoke up. I never wanted to be the center of attention. I hated it when people said I was "smart." In fact, I would argue with them. "I'm not smart. I just work hard. Anybody could achieve what I have done if they worked hard." My goal was to blend in, to fit in. There are words I never would have chosen for myself. Powerful is one that comes to mind. Confident is another. In our teacher's lounge/workroom, there is a poster that I see every time I go to make a copy. It shouts: "Somebody Needs You!" And, it features a quote from Larry Bell: "On your worst day on the job, you are still some child's best hope." I have the power to change a student's life. Let me rephrase that. I have the power to change a student's day, to make it better or worse. And, the sum of those days forms a students' life. So, my every decision changes lives. I teach in a small, rural school district, but, with the exception of gangs, we face most of the same obstacles faced by inner-city schools. Drugs. Lack of parental involvement. Students living with and being raised by people who aren't even related to them. Most of their parents didn't go to college. Many didn't even graduate from high school. Many students have one or both of their parents incarcerated. I sit in meetings, and I hear the heartbreaking stories of the things they have had to go through. Abuse. Abandonment. Things I could never imagine going through. And, it hurts. I want to be able to change things for them. But, I can't erase their pasts. And, I can't change the situations they find themselves in currently. I get overwhelmed by all that I can't do. Sometimes I forget that there are things I can do. They are small things. But, they are powerful things. Lately, I've been finding myself writing a lot of notes. It started after my birthday. I wrote a short thank you note to all of the students who brought me cake or cupcakes or a card. These thank you notes were meant to be a private thing, a small token of my gratitude. But, they were a bigger thing to my students than I realized. To me, it was just a note. To my students, it was tangible proof of their worth and value. I mentioned something to our special ed teacher one day about one of her students surprising me with a gift. She replied, "I know. She was so proud of that thank you note you wrote her. She had to show it to me." Then, Christmas came. Christmas gifts from students meant more thank you notes. After all, my mom raised me to send a thank you note after receiving any gift. I passed out thank you notes. And, I had students thanking me for their thank you notes. "Your note almost made me cry. I'm going to keep it forever." When I heard this, I felt bad. I couldn't have told you what I had written in the note. To me, it was just a note; I was fulfilling a societal expectation. To them, it was so much more. While my students were taking semester tests, I set out to write some Christmas cards. One student stayed after school to work on bringing his grade up to passing. He saw my pile of Christmas cards that I had written to various family members, friends from college, and people from church. Unashamedly, he asked me where his Christmas card was. I tried not to act shocked. "Would you like me to write you a Christmas card?" He replied with a simple, "Yes." Then, he stood at my desk and waited while I removed a card from the box and wrote a short note. I wrote the note, stuffed the card in the envelope, and scrawled his name on the outside. I handed it to him, and he walked away, satisfied. A day or two later, I was once again talking to the special ed teacher. We were going through the list of IEP students in my classes and their current grades. When the conversation turned to the student who had been working in my room after school, the teacher told me how nice it had been of me to write him a card. "He's been carrying that card around in his pocket all day and showing it to everybody! He's so proud of it!" I filled her in on just how he came to have a Christmas card from me in his possession. To me, if I had to ask somebody to write me a card, it would diminish the value of it. But, I forget that I grew up in a different world than most of my students. I grew up with two parents who are still married to each other to this day. I grew up, surrounded by people who told me how much I mattered to them. I never doubted that I was loved and would be cared for. I never wondered where my next meal would come from or who would pick me up from school that day. I had a life of constancy. I had a life of stability. I had a support system that I felt like I could truly depend on. These are luxuries that many of my students lack. I didn't need a piece of paper to remind me that I was valued. But, what if my life didn't look the way it did? I can imagine that having something tangible to hold onto would be a most meaningful thing. Most recently, Valentine's Day brought the opportunity to write more thank you notes. I wrote cards to the three students who got me candy. But, I didn't stop there this time. I wrote a note to a student who often comes in during her free period to help straighten up my classroom. I wrote a note of thanks to a student who stepped up and led the class when a fluke left me in a meeting and my class without a sub. These notes cost me little to write. I buy packs of 8-10 cards for a dollar at Target or Dollar Tree. I picked up a cute "Thank You" stamp this summer from the Dollar Spot at Target. 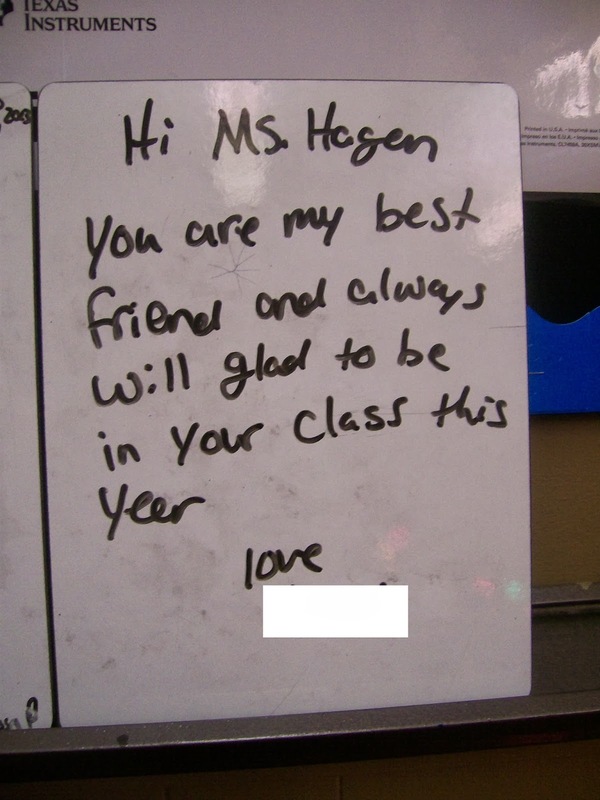 But, by now, I know just how much these notes mean to my students. As I was passing out some of these most recent thank you notes, one of my students questioned me: "Where's my note? Why don't I have a note in the pile? You should write me a note!" I wasn't prepared for this question/demand. This student is an especially sweet one. She often comes in my room before school or at lunch to just talk. She is always leaving me sweet notes on the board, thanking me for being her teacher. Why shouldn't I write her a thank you note? So, I sat down and penned her a note. I also penned a note to the other girl who was sitting in my room at the time. She often arrives early and comes to hang out in my room. We talk about movies and the best youtube videos. She tells me about getting her nails or hair done. It's nothing deep, but I love that she feels like I am someone she can talk to. The bell rang to start the day before I could give either student their note. I gave one student her note when she came into my room for lunch. She excitedly read it and thanked me for her thank you note. I didn't get a chance to give my note to the student who had requested one until that afternoon when I had her in class. After reading her note, she came up behind me, smiled, and said "Thanks! I love you, too, Ms. Hagan!" Why have I focused so long on the things I can't change for my students instead of things I can do? Maybe it's the math teacher inside of me. I see the problems they face. I see what little I can do. The inequality is apparent. The problems my students face > What little I can do. That's no excuse, though. If I can do something, no matter how little, I need to be doing it. I need to look at the inequality like this: The problems my students face > What little I can do > Zero/Nothing. A positive difference is exactly that. It's positive. It's greater than zero. As this school year starts to wind to a close, I want to make sure every student gets at least one handwritten note from me. Will some throw them away without a second thought? Certainly. Will some thank me profusely? Yes. And, I'll probably never get quite used to being thanked for a thank you note. I'll never know the true impact of these notes. But, I'm not going to let that stop me. These students deserve this much from me. They deserve to be reminded that someone cares. They deserve something tangible that communicates the fact that they matter. I'm inspired by Rebecka Peterson's recent post on One Good Thing. Every Friday, students are allowed to write her letters about anything they wish. On Mondays, she presents them with a letter in response. How simple and yet amazing is this idea? How many students do I have who would write something in a letter that they would never be brave enough to ask me in person? So much of my time is spent managing the students who are loud, the students who misbehave. I end up missing forming connections with the students who are quiet, who always do their work, who never ask questions. They slip through the cracks, and this is not okay. I realize this school year is almost over, but I'm going to give this a try. Next year, I want a mailbox to set by my desk. I want a physical reminder to students that they can talk to me about anything. If they're too scared or shy to talk to me about it in person, they can write me a letter. And, I'll write them back. I love opening my mailbox to find a letter or a card. I think all of us do. If I was to write a poem about myself now-a-days, it would probably differ vastly from the ones I wrote in school. Adjectives that come to mind? Teacher. Life-impacter. World-changer. Difference-maker. Inspiring. Powerful. I have no doubt. I am in the correct profession. This profession has empowered me to become the person I always knew I was meant to be. From here on out, I'm going to set out to not only changes the adjectives that come to mind when I think of myself, but I'm going to change the adjectives that come to my students' minds when they think of themselves, too. Before I forget, I've got to update you on the whole bat situation. Last Thursday, I found a bat in my classroom while grading papers after school. It was barely moving at all, and I assumed it was sick. I didn't get too close because I did not want to end up with rabies. I left my classroom door open and turned off the light, hoping the bat would leave of its own accord. Friday morning, I turned on the light in my classroom and crept into it. I felt a little like Indiana Jones. I knew the bat could fly at me from anywhere. I'm sure I would have been quite a site if somebody had been watching me creep slowly into my classroom. I snuck up to the front of the room to where I had left the bat the night before. Nothing. But, that didn't mean I was free and clear. The bat could be anywhere. The custodian was at school, unlocking doors and emptying trash cans. I stopped her to explain why I had left my door open. She's had a lot of experience with bats in our 1919 school, but she said she was surprised that one had been spotted so early. Usually, they don't come out until summer. She did another check of my classroom to make sure the bat wasn't hiding anywhere. By the time she left, I was pretty confident that my room was bat-less. We have a faculty meeting every Friday morning at 7:30. I showed up a few minutes early and filled my principal in on the bat situation. Another teacher arrived. She had found a sick bat laying outside the door to the principal's office. (I'm 99.7% sure it had to be the exact same bat.) She had called the science teacher to pick up the bat and take care of it. People, this is why I do not teach science. Our science teachers are continually being brought random animals that students find around campus. Turtles. Rabbits. Frogs. Kittens. And, now, bats. You could not pay me enough to attempt to nurse a sick bat back to health in a box in my classroom. The last I heard, the bat was on its death bed, and they were trying to feed it a slice of apple. I think I'll gladly stick with my numbers. Numbers don't need their cages to be cleaned out. Numbers can't give you rabies. Numbers don't need to be taken home and cared for over extended school breaks. One of my students drew a picture of the bat to commemorate my experience. I like the looks of her bat a lot more than the bat I found lying on the floor of my classroom!